In recent weeks, we have explored African American artists who were self-taught, and one who is contemporary and explores the background of black people in American culture. 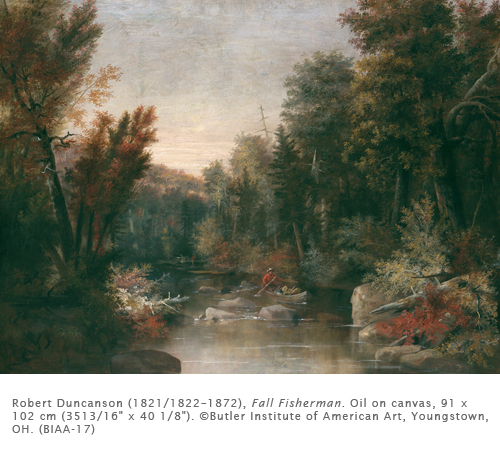 This week we will explore an artist who, in my (overanalyzing) art historical mind, should be considered a pioneer of the early American landscape: Robert Duncanson. He painted at the same time as the Hudson River School artists, and had the fortune to spend his formative years in Cincinnati (an awesome town with an awesome museum). Although Duncanson was primarily self-taught, he quickly learned the taste of American patrons for romantic scenes of the American wilderness. Such scenes were madly popular in the first half of the 19th century in America as cherished documents of the growing new nation. Duncanson was the child of an African American mother and a Canadian father. Although he was born in New York State, he was raised in Canada, where he was able to attend good schools. In school he developed a love for English poetry and literature, which helped to form a romantic sensibility that shaped his later painting. As a young man he enjoyed painting scenes from English literature. His parents separated and he joined his mother in Cincinnati in 1841. At the time, Cincinnati had the largest population of free blacks and former slaves of any American city. It also had a lively artist community that was more accepting of African Americans than cities like New York or Philadelphia. In Cincinnati, Duncanson declared his determination to be an artist. He was primarily self-taught. Mount Healthy and Fruit Still Life are representative of his early period and show a naive quality and an insistence on specific realism in details. They are reminiscent of the early American limner tradition. However, the artistic community of Cincinnati was impressed with his work and the Art Union of Cincinnati exhibited three of his works in 1842. He was the first African American artist to have his work displayed with white artists. By the late 1840s, after studying engravings and the work of European painters, his style evolved into a combination of American Realism and European Romanticism. The primary influences on Duncanson’s mature painting style were William Sonntag (1822–1900) and Worthington Whittredge (1820–1910), both of whom were associated with the Hudson River School. The Hudson River School was the first prominent American “school” of painting. This group of artists worked in a romantic-realist style and painted scenes of the Hudson River Valley that emphasized the grandeur of nature. A visit to Italy in the late 1850s added to his romantic tendencies. Duncanson was impressed with the ruins of ancient Rome and began including them in his paintings. Like Frederic Church (1826–1900) and Asher B. Durand (1796–1886) of the Hudson River School, Duncanson painted huge panoramic vistas, often enhanced by dramatic lighting. Although he often painted real locations, Duncanson preferred to idealize the landscapes. His work was very popular in Canada. His murals in the Longworth Mansion in Cincinnati became the core of the collection of the Taft Museum housed in that building. Activity: Using pastels, draw a romantic landscape with what you know about warm and cool colors or a seascape or just plain clouds. In order to increase the emotional input into this drawing, crinkle the paper or add gesso for texture. Make sure to pay attention to color to heighten the mood of the landscape.